I’m working on another novel. 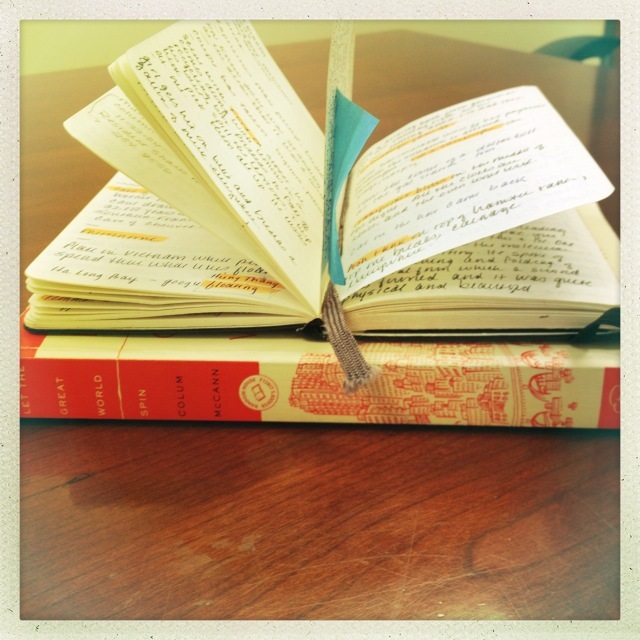 Here’s the recipe I’m using: one part note-taking + one part reading + one part drafting. So far it seems to be working, but I find that any time I reduce an element of the ratio, the formula goes wonky and the work tends to get off track or—worse—to stagnate. The note-taking and the reading are just as important as the drafting, because I have to keep filling the beakers in order to create new catalysts. Or it might be a moment in another writer’s story or novel—one of those awe-inspiring lines that makes me determined to work harder, read more, push further. Moments that make me remember why any of us are in this game in the first place. Something like this, from Bret Anthony Johnston’s remarkable story “Soldier of Fortune”: “The edges of her curtains were again framed in moonlight, and in the shallow glow, our skin looked new and smooth and unblemished, ready for the scars that were lying, somewhere, in ambush.” Dang. Just—dang. So yes, the notebook is hugely important. I keep it by my bedside, too, because when I wake with ideas or questions in the middle of the night, I know from heartbreaking experience that if I don’t write down a few notes that will jog my memory in the morning, those fleeting REM-laced ideas will be long evaporated by dawn. Reading, watching, listening, absorbing, hunting, gathering. Sometimes scraping up just the scantest berries, sometimes bringing down the entire mammoth. I love this part of the job. Great post! And a great reminder. Sometimes I get so caught up in the drone of daily life that I forget to listen. Joshilyn Jackson (author of Gods in Alabama, etc)says to watch yourself if you spot her in a cafe or restaurant, particularly if you’re in the next booth or at the next table. She’s listening in on your conversation and making notes. If you say something to hook her, it will show up in one of her books. I just finished Heart of Palm and had wondered about some of the off handed scenarios that were woven into the story.